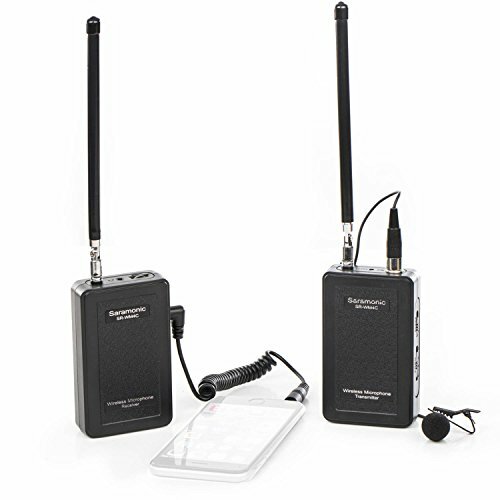 The Saramonic SR-WM4C is a compact lightweight VHF wireless microphone system- a perfect audio solution with real-time monitoring for recording simply and easily, free from the limit of distance. The SR-WM4C is ideal for film making, conducting broadcast interviews and business presentations or any other need requiring portability and great sound quality. The slim, low-profile clip-on omni-directional microphone transmits its signal via a bodypack transmitter to the receiving unit. Both the Saramonic receiver and transmitter are lightweight and easy to use - offering ultimate flexibility without sacrificing high-quality audio. This set includes the Saramonic SR-WM4C receiver, Saramonic SR-WM4C bodypack transmitter and omni-directional clip-on microphone. Saramonic cable adapter SR-PMC2 is designed especially for IOS devices with 3.5mm jack, which provides you excellent audio and recording experience with stereo system. The Saramonic SR-WM4C working with Saramonic SR-PMC2 can be used for IOS devices like iPhone 7 7 plus 6 6s iPad. Providing excellent recording experience for iPhone video. With a simple and lightweight cable SR-PMC2, distant recording is no longer a question for iPhone holders. Moreover, the iPhone video can enjoy fabulous recording quality as good as that from DSLR.